Hurricanes Harvey and Irma have provided all the pictures and stories that the newscasts and newspaper columns could ever want in recent weeks. Understandably, the focus has been on the here and now. The US hog and pork industry has not been severely affected by Hurricane Irma but, at the time of writing, it remains to be seen if the tropical storm will affect facilities in North Carolina. In this Blog, however, I want to raise issues that go beyond the immediate impact of this extraordinary hurricane season. In particular, I want to draw attention to a “perfect storm” that may be developing because of the interaction of; China, the US dollar’s exchange rate, and hurricane-damaged infrastructure in the USA. President Trump plays a part too. The US hog price could be on the floor by the end of the year if the interaction between nature and economics and government goes the wrong way. Let’s start with China – a frequent subject of discussion here. 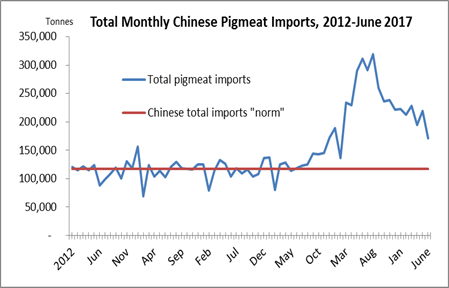 In my last Blog I drew attention to the collapse in China’s demand for imported pigmeat. The updated chart for this series is presented alongside (see Whole Hog Brief #271 for a more complete discussion of this issue) and this chart shows how China’s monthly demand for imports is now fast approaching its “norm”. The 2016 boom in imports is history and exports from the USA and from the EU have fallen significantly to China this year. That, in itself, should worry pigmeat exporters and Western pig producers. But there is more to worry about. The US dollar has had a bad year – its exchange rate has fallen against all major trading partners. It’s down around 20% against the Mexican Peso and by about 8% against the Canadian dollar. It’s also lost about 12% against the Euro. All this has happened since President Trump’s inauguration – that may be coincidence and I will not dwell on the correlation except to say that Wall Street investors have been vocal in their dismay with Trump’s slow pace on his promised infrastructure spend and tax reforms. The so-called “Trump bump” in US stocks petered out at about the same time as the dollar’s weakness began. Trump has, at least, not disrupted the export trade in US pork by tearing up NAFTA or KORUS (yet) so US farmers should be thankful for small mercies. And, although Wall Street has been disappointed in Trump, the farmers might want to thank Trump for the weak dollar. In Mexico, Japan, China and Canada, all those US pork exports will have looked relatively cheap as the months went by in 2017. Now, what about those hurricanes and how do they link up with China and the US dollar? Let’s state the obvious – hurricane damage will need to be fixed. And since the damage has been extraordinary there will be a need for extraordinary expenditures on repair and replacement. We are talking hundreds of billions of dollars to restore life in Houston and most of Florida to what it looked like before the storms. You can add in a few more hundreds of billions when the indirect and multiplier effects of these expenditures are taken into account. Voila – an infrastructure programme arrives! And that means jobs and investment (and maybe inflation) and growth. Hence, the Trump bump may yet be on its way back and it could be enough to reverse the weakness in the US dollar. Furthermore, if Trump’s tax reforms ever arrive they would likely reinforce this reversal in the dollar as US companies bring dollars back to the USA. 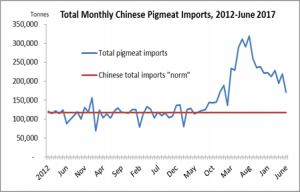 If (and I know that there are many ifs) China’s demand for imported pigmeat continues to fall, and the dollar strengthens we could see a situation in the USA where the current expansion of hog supplies arrives at a time when demand is under serious pressure from weaker export demand and higher prices (in foreign currency terms). That’s the perfect storm.